It’s hard raising a ninja. There are all the karate lessons, the broken furniture as he practices his latest moves, the late nights when he’s out fighting evil, the times that he just disappears on you completely… And that’s not even mentioning the laundry you have to deal with as he stains and tears yet another outfit. You’ve already been to the dry cleaners’ twice this week! 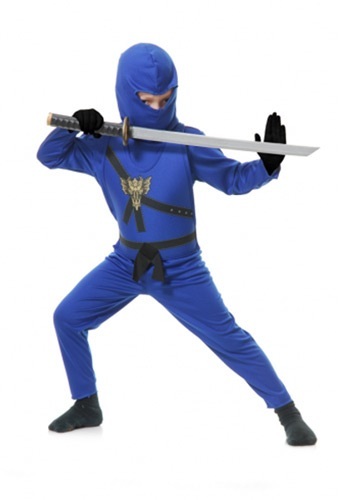 We have the perfect solution for you: our Blue Toddler Ninja Costume. This costume offers all the protection and anonymity a growing ninja needs while also giving parents peace of mind thanks to its easy cleaning instructions. Just toss it in the washing machine and it’s good to go! It comes in a fashionable blue to help your little ninja stand out amongst his peers (otherwise, you never know who to videotape at karate tournaments) and features a ferocious dragon on the front to remind bad guys not to mess with your taekwondo tyke. It also includes a mask that keeps your crime fighter’s identity secret, which is even more imperative in this age of ubiquitous social media. You can’t have someone broadcasting your ninja’s face across YouTube! The Blue Toddler Ninja Costume will ensure that he’s always able to disappear into the shadows and continue his one-toddler mission of bringing justice to playtimes everywhere.